New York's Mobile Fuel Solutions (MFS), a solutions company for the supply of fuels, is preparing to implement the first of two "virtual pipeline", a transport system for compressed natural gas and distribution units devised by the Argentina company Galileo Technologies, which will tour the US routes supplying load points. MFS fully trust this mechanism to help spread the use of natural gas vehicles, and it will allow large fleets switch to cleaner fuel without investing in costly service stations difficult to achieve an installation permit. "What we want to do is include the virtual pipeline around the existing infrastructure," said Dean Sloane, CEO of MFS. The first unit of Galileo "will be operational in early February," forward. 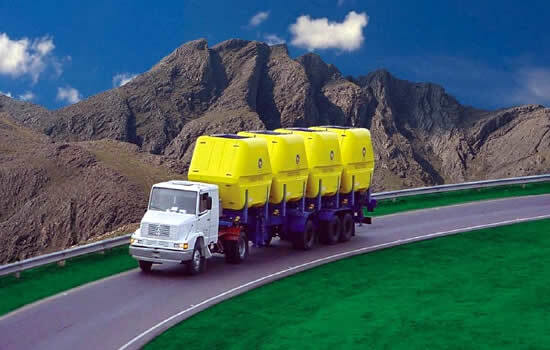 The "virtual pipeline" is a trailer with two "pods", each filled with horizontal CNG cylinders. Has two batteries, one cylinder 39 capable of delivering 418 gallons (3.8 liters) of gasoline equivalent in CNG 28 and the second cylinders, capable of supplying 297 per charge. MFS plans to deploy a second unit VTS-2 at the end of the first quarter, but sees potential for larger teams, up to four batteries in the future according to customer needs: "They can be refilled as needed or create a station permanent "daughter" minimum capital "said the CEO. Sloane appointment beer delivery trucks as initial users of mobile CNG but notes that other organizations, including waste management and the Department of Sanitation of the City of New York are interested in their services. MFS has agreements with Trillium CNG filling stations units of Long Island and is building a CNG installation north of the city of New York, Its launch in July and will be equipped with a Galileo "Gigabox" capable of 3000000-5000000 pumping GGE per year. How is the Virtual Pipeline work? The compression system and load CNG storage modules to be installed Virtual pipeline taking gas from various sources of gas. A compressor unit takes Microskid® Microbox® or low pressure fluid and compressed to a pressure of 250 bar, filling the storage modules which are on the pallets. Once charging is complete, the modules are loaded on the VST trailer truck to be transported to consumption centers by road from the compressor station and cargo to different destinations consumption by tractor with trailer VST specifically designed for the safe transport of the modules. The Virtual Pipeline Galileo can be used in countless applications, equipment specially designed for each particular need. For example, in places where there is a need to load CNG vehicles and the conditions do not allow connecting a dispensing station to a conventional gas network, the best alternative is to install a CNG Station Remote with Virtual Pipeline.